The best hostel in the world!!! Great hostel, good location and very good personal. They say they don't have a free breakfast but put snacks and a apple cake in the kitchen every morning. Also every day they have free cooking classes. Rooms are big and tidy. Cleaning ladies keep cleaning! Best hostel I've been for a while. After my check out I was free to hang out and use all the facilities until my train left at 23:30, check out is at 12:00.. I would recommend this place to everyone. One of the best hostels I ever had the pleasure of staying at. Everything is totally in order and both the staff and the general atmosphere is great. A very social place, easy to make friends and very accommodating to any questions, requests, etc... It has my definite recommendation! Best hostel ever! Super clean, lovely staff, perfectly located and more facilities then I ever had. Oh another plus comfy beds with privacy, free lockers with built in sockets! Would recommend anyone staying here! I would love return! Very good! Enjoyed my stay. Super nice hostel!! 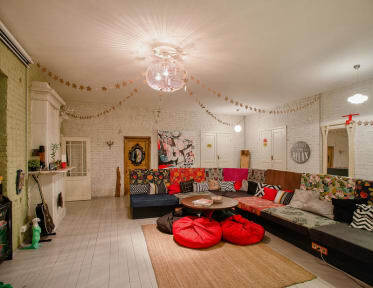 First time in 10 years travelling i took the time to write a review and this hostel is worth it!! Staff: 10/10 Common room/kitchen: 10/10 Clean: 10/10 (maids clean everything like every 4h) Location: 10/10 everything in walking distance Facilities: 9/10 (game room!, shoe warmers, free locks, free international calls etc --) only thing missing is a fridge where they may sell some drinks) So thanks soul kitchen! You made my stay veryy enjoyable!! Ok, this stay was awesome. Never saw aything like this. It is somewhat more expensive thsn other hostels, but whst you get is amazing. The place is extremely clean (even got a robotic vacuumcleaner) and the athmosphere is great. The place is very specious and packed with common rooms. Extremely easy to get in contact with other travelers. Alot is free to use. Towels, coffee, tea, hot chocolate, cereal, pasta, printing. Been to a lot of hostels, but this has been the one is the best ever. Supersfeervol, schoon en ingericht zodat de gasten elkaar ontmoeten.